El más poderoso antitanque americano. El M36 se desarrolló sobre el chasis de la artillería M10A1 y M10. 2324 vehículos se produjeron entre noviembre de 1943 y septiembre de 1945. It is very similar to the M10 Wolverine, with increased armor values and the ability to mount the powerful 90 mm AT Gun M3. However, it cannot mount the 105 mm AT SPH M4 L23 that's available on the M10 Wolverine. Upgrading to the roofed turret is a good idea as the roof protects the crew from the extensive HE damage open top vehicles are vulnerable to. Even though it has a turret, remember that the M36 Jackson is a tank destroyer and not a medium tank. By keeping the hull still and only rotating the turret to fire, Camouflage Nets and Binocular Telescopes won't reset, making it one of the more difficult tank destroyers to spot when used properly. While the M18 Hellcat is built for speed and mobility, the M36 Jackson is built for sniping and hull-down positions. Its gun depression is excellent, so it can often use small hills and terrain changes to expose only its turret to enemy fire. The 90mm gun is very accurate and aims fast by mid-tier American standards, enabling the M36 to snipe to good effect. Although the M36 does have a turret, the standard tank-destroyer rules still apply: keep a distance, use camouflage or cover, and always watch your flanks. 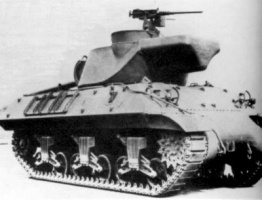 The M36 is fairly maneuverable, but the slow turret traverse means it can be circled and its response time is slow. Climbing hills may also be a problem to this tank destroyer. While better armored than its predecessor, the M36 is still mostly paper to the guns it faces. Do not trust the shop statistics - the 114mm armour thickness is only on your transmission cover. Your hull front is 60mm at 45 degrees and your turret sides 25mm at 45 degrees, and even your most armoured part, the gun mantlet has a total of only 150mm. That said, the turret armor can take a beating if required and always use hulldown when possible. Engines and radio carry over from the M10 Wolverine - install immediately. Your tracks can't hold the 90mm gun. Research that first. Finally, research the turret. It gives 20 HP and a closed top, which may be helpful against SPGs. However, it adds a muzzle brake to your 90mm, which hurts your camo rating even more when you fire it. 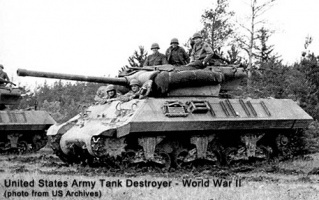 The M36 Tank Destroyer, formally 90 mm Gun Motor Carriage, M36, was an American Tank Destroyer used during World War II. It was known as Jackson or Slugger by the British, after the Confederate general Stonewall Jackson. American soldiers usually referred to them as TDs for 'Tank Destroyers'. The M36 first served in combat in Europe in September 1944, and served until the end of the war; it also served during the Korean War, and in the armies of several other countries. With the advent of heavy German armor such as the Panther and Tiger, the standard U.S. Tank Destroyer, the 3in Gun Motor Carriage M10, was rapidly becoming obsolete, because its main armament, the 3in M7 gun, had difficulty engaging these new tanks past 500 meters. This was foreseen, however, and in September, 1942 American engineers had begun designing a new Tank Destroyer armed with the M3 90 mm gun. This was several months before any Allied unit encountered a Tiger in combat, as the British First Army in Tunisia was the first western Allied unit to encounter the Tiger I in the leadup to the Battle of the Kasserine Pass at the start of 1943, and well over a year before any US unit encountered a Panther in combat. 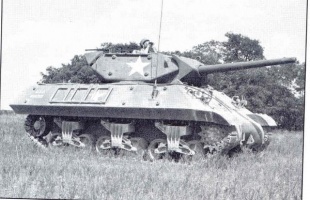 The first M36 prototype was completed in March 1943, with a new turret mounting the 90 mm M3 gun on a standard M10 chassis. After testing, an order for 500 was issued. The prototype was designated T71 Gun Motor Carriage; upon standardization the designation was changed to 90 mm Gun Motor Carriage M36 in June 1944. Like all US Tank Destroyers, the turret was open-topped to save weight and provide better observation. Postwar, a folding armored roof kit was developed to provide some protection from shell fragments, as with the M10. The M36 had a large bustle at the rear of its turret which provided a counterweight for the main gun. Eleven additional rounds of ammunition were stored inside the counterweight. 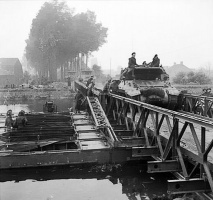 It was not until September 1944 that the vehicle first began to appear in the European Theater of Operations. About 1,400 M36s were produced during the war. 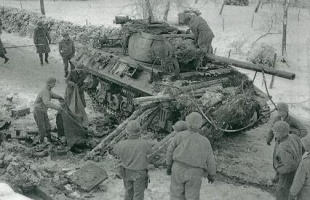 The need for 90 mm gunned Tank Destroyers was so urgent that, during October-December 1944, 187 conversions of standard Medium Tank M4A3 hulls were produced by Grand Blanc Arsenal. These vehicles, designated M36B1, were rushed to the European Theater of Operations and used in combat alongside standard M36s. The M36 was well liked by its crews, being one of the few armored fighting vehicles available to US forces that could destroy heavy German tanks from a distance. After World War II, the M36 was used in the Korean War. It could destroy any Soviet-made AFV deployed in that theater of operations. 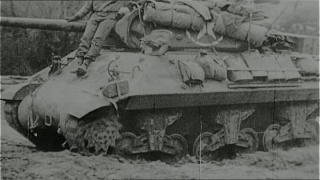 One postwar modification was the addition of a ball-mounted machine gun on the co-driver's side, as in many other armored fighting vehicles of the time. 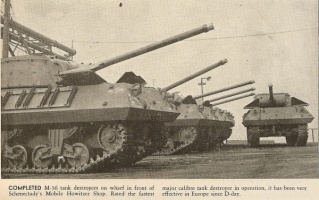 M36s were also exported after World War II to various countries. One of the recipients was Yugoslavia where the engine was replaced with the 500 hp Soviet-made diesel engine used in T-55 main battle tanks. 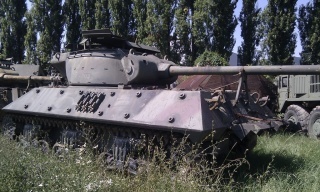 Yugoslavian M36s participated in the Croatian War of Independence (1991–1995) but they are no longer in service with the Croatian Armed Forces due to their withdrawal immediately after the war. 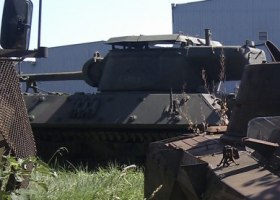 M36s were also used by Serbian forces in Bosnia and Croatia, and they were used during the Kosovo War as decoys for NATO air strikes. The M36 was used by the French army, during the First Indochina War. They were also supplied as part of U.S. military aid to Pakistan in the 1950s and served in the Indo-Pakistani War of 1965. The Republic of China Army acquired eight ex-French examples in 1955 and had them stationed in Kinmen island group, where they are deemed more maneuverable than the bigger M48A3 and later CM11/12 MBTs while being more powerful than M24 and M41 light tanks. As of April 2001, at least two still remained in service with troops defending Lieyu Township. M36 Jackson aka Slugger Photos & history.